Posted on the 1st October 1916, this card shows Mansfield Midland Station which was used by soldiers in the early years of Clipstone Camp. Soldiers and wagons can be seen to the left of the picture. The message on the back sent from Fred to his dad, sister and brother says, ‘just a line to let you know I am in the best of health and getting plenty of grub’! Fred was possibly a soldier at the camp. Figured it out. Someone has reproduced the photograph, but before doing so has covered the bottom of the photograph very carefully with paper, after cutting out to make the picture look like a natural scene. The station closed in 1964 and reopened in 1995. Need some help here, what at first appears to be the camber of the road in front of the Station, when one tilts the screen of the picture, there appears to be railings of some description, or other, right in front of the camera lens. Which also falls in line with the people , the horse and people carrier, plus the building lines of the Station and road kerbs. Any Ideas? Great picture. The young Miner coming home from the pit caught my eye. Pit helmet , work clothes, can’t see his boots, but he’s in all his ” Muck “, making his way home to the Victoria St. area. Hope he missed what looks like a concrete block in front of him. 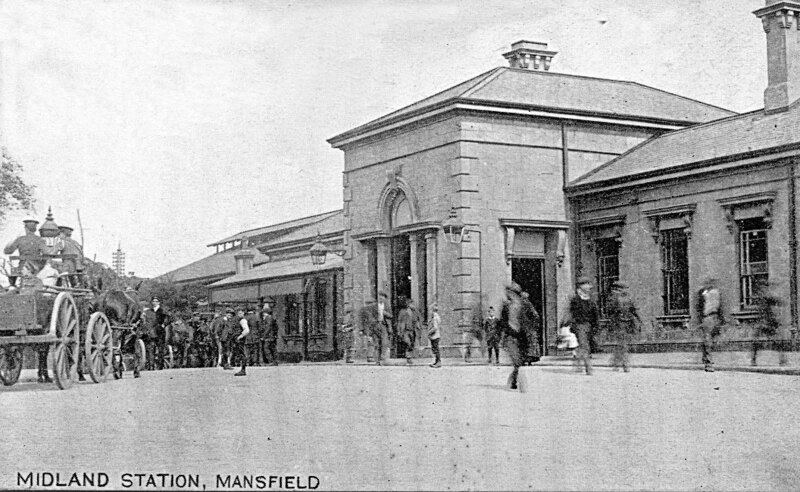 The scene of the station didn’t change at all from the time the picture was taken, to the time it closed. 1956 was it ?